Go to Design>Edit HTML and find the below codes. only one thing i want to ask, How can i adjust the width of this template? @topic i,m loving this theme.simply amazing. I like it’s clean look! 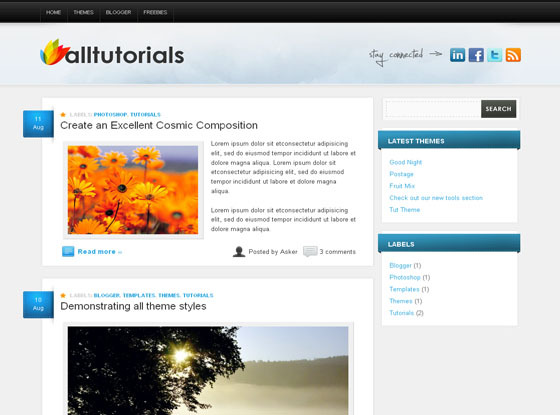 I have installed this theme already on my blog and i liked it! Thank You! can u please help me & tell me how to add rss feed?????? Hi. THanks for this theme. I have change my favicon in design. But it won’t change even after i clear my cache. Please give me some idea. THanks again! Hi, may I know whether I can change the blue-sky background image behind website title? If so, please lead me on how to. Your help will be much appreciated! looks good. is it possible to change the color of blue widgets title bar? Excellent Template And How To Set Top BlackBar Menu?,Its Doesnot Shows My PagesLinks,Its Showing Only A Blackbar….Please Help Me……….